as a poor and unknown artist?" Despite the fact that the paintings of Vincent van Gogh are being sold for tens of millions of dollars today, he died poor and desperate because his art didn't sell during his lifetime. Isn't that a tragic fate for such an outstanding artist? Did you know, that Pablo Picasso and Salvador Dali both became multimillionaires in their lifetime because of their art sales? They did not share the tragic fate of poor artists like Vincent van Gogh. What is the difference between van Gogh and Picasso or Dali? What made the latter successful AND rich so quickly? Do you believe, that those ingenious artists became famous and successful only because of their outrageous artistic capabilities? Picasso and Dali were not just ingenious artists; they were ingenious in the promotion of their art as well. Have you ever heard any of the uncounted anecdotes about Picasso? Or the unusual public appearances of Dali? Those events didn't happen by accident. Both of these artists did them on purpose as a way to market their art and make themselves famous. Even today public relation experts and professional advertisers can still learn a lot from their successful PR-coups (famous contemporary artists like Jeff Koons or Damien Hirst know and apply their secrets, too!). Do you want to sell more art and earn your well-deserved share of the profits, so you can make a living? Do you have the feeling that you do not really understand how the art market works? Do words like "selling" and "marketing" rather frighten you? Would you like to see your name in the media instead of the omnipresent Damien Hirst, so that the people are calling you and know your name? Do you want to have an easy-to-follow plan to give your professional reputation and art business a huge lift? Do you want to know why even mediocre artists become famous and successful, if they apply the right marketing techniques? If your answer to any of these questions is "Yes!" and you want to walk in the shoes of Picasso and Dali, the eBook "Promoting & Selling Your Art" is the right choice for you. build your reputation as a professional artist - Are you sick of being considered an "amateur" or a "housewife"-artist?! Professionalism starts with your image and the presentation of your work. From your personal appearance and your resume to building your credentials you will learn how to show everyone, that you are an artist and must be taken seriously. People won't laugh anymore about your art, they will buy it! price your work for maximum profit - Do you wonder how to price your work? This is one of the questions we get most frequently asked by artists. We will show you how to price your art for the highest profit and how to avoid spoiling your market value. find the right gallery for you - Seeing your work hanging in a respected gallery. Having the own art shows featured in the media and having prominent guests. Those are the dreams of many artists. Get a look behind the scenes to see what makes the difference between the frustrating run from one gallery to the other and galleries wanting to feature your work. Being able to judge the sale potential and standing of a gallery can boost your career instead of losing money with a "black sheep" of the gallery world. feed and care for collectors - The collector is the artists best friend. If you build a solid base of your own collectors, you will not only make a living from your art, but finally earn the money and enjoy the lifestyle you always dreamed of. Turn collectors into your loyal fans and get your art sold, even before you have created it. organize and execute successful exhibitions - Are you tired of exhibitions where you end up sitting alone in the showroom for the whole day or people eat your refreshments and don't buy a single piece of art? Learn how to plan and promote and how to get the right people to your show. showcase your work in the right frame and close the sales - Are you afraid of the people asking for the price? Or do you even hide from your audience, because you don't know what to say if it comes to selling? Making a sale and closing a deal can even be fun. We will also tell you how you can invest in your own future, so that not only your buyers will profit financially from you as a rising star in the art world (Pablo Picasso was a master of this often neglected "investment technique"). get attention from the media - Do you want to know how to get the media involved? Media coverage is not difficult at all, if you know how the media business works and which buttons you have to push. When you see your art in the newspaper, that is not only good for your ego, but for your bank account, too. and many more tricks and hints, that you don't have to learn the hard way. Isn't it always easier to ask someone, who has already been there, how to get there than making all the mistakes oneself? 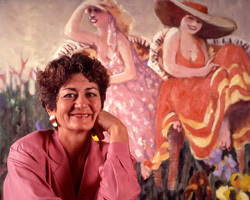 For more than 40 years Carole Katchen has been a professional and successful artist and author. 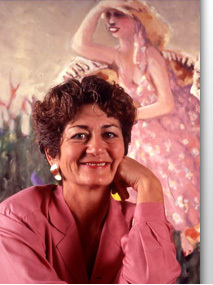 Her award-winning paintings, sculptures and printings have sold in 32 countries on 6 continents. You can find her work in private and public collections, including the collection of Bill Clinton, the former president of the United States. Katchen has published 17 books, which have sold over 1 million copies and she has written numerous magazine articles for Cosmopolitan, Parents and several art magazines. She is also a Contributing Editor to The Artists Magazine and a featured columnist for International Artist. Above all: For decades she has been a successful artist herself. Based on her own experience Carole Katchen knows the artists' problems around promoting their art. That is the reason why she wrote this book already in 1978 to show artists the secrets of success in promoting and selling art. During the past decades she has proven herself, that her advice really works "out there". She has up-dated her book in this special eBook format, too. "Promoting & Selling Your Art is a highly readable, informative book for artists who have talent and ambition, but limited business experience." "If you happen to be an illustrator or photographer interested in expanding your market beyond those in advertising and editorial (this) would be (a) most valuable addition to your library." "It's a fascinating, well-written account of the artist's life which will be well worth a gallery owner's time to read." "There is a wealth of information in Katchen's book and though some of it might not seem right or relevant for a particular artist, there is a great deal more that should prove valid and valuable for every artist." "(This book) represents the kind of information anyone, professional or amateur, should know in order to protect their rights and establish their reputation in the art world." "Ms. Katchen has covered all grounds thoroughly." "The results are sheer practicality." "The versatile volume offers sound marketing advice aimed particularly at artists on the thresholds of their careers." Is "Sell" a Four-Letter Word? and sell art works I've ever come across." 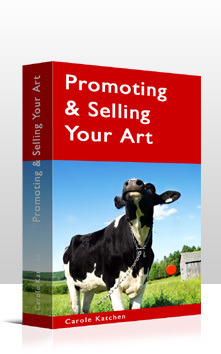 "It is the best informative book on how to promote and sell art works I've ever come across. Clearly, Carole Katchen is a brilliant artist who understands how to unblock the mind of a new and insecure artist. It is well researched, easy to understand and follow, and everything that one needs to know. For too many years I wasted valuable time wondering as to how to pursue my artistic talents professionally and very nearly gave up hope until by chance came across Carole Katchen's book. I have done several paintings, but I either give them away as gifts or they land up in my shed collecting dust. But now I know exactly what to do and I wish to thank Carole for helping me achieve this." "Yes! The ebook is very helpful!" "I was very satisfied with the ebook. It was easily readable and understandable. I appreciate very much Carole Katchen taking time out to write something to help other artists. It's very hard to know where to turn or what to do, especially if you're a self-taught artist trying to make a career. Yes! The ebook is very helpful! Thank you so much!" "I am enjoying the book very much. It is very practical and positive and am learning valuable and essential information from it about promoting my art." and I am currently putting it to use." "Thank you for the follow up on the book. I downloaded the first three chapters online and after reading them I had to purchase the entire book. I'm glad I did. There is some great advice in it and I am currently putting it to use." "Thank you. I have really enjoyed the ebook and have found much of the information worthwhile and applicable." "I consider it my "art bible"!" "I can't tell you how much I love that book. I consider it my "art bible"! It was like God led me to your book. I have been an obscure artist due to the fact, I had absolutely no idea how to promote and sell my art. The book was an easy to understand guide for me. I printed it, and read it over and over. The only area I felt that could be more in depth would be on the subject of "Fine art street fairs". The book covered the subject only briefly. Overall, it is excellent. I really can't thank you enough for making it available at such a reasonable price." >> Order now "Promoting & Selling Your Art"
After your purchase you have 60 days, a full year to ask for a refund of the money, if you are not totally satisfied with the eBook. So, you have enough of time to test the ideas and the advice from the eBook in your real life as an artist and to see for yourself the successful results. If you want to have your money back, just send us an e-mail. No questions asked. And you can keep the eBook in any case. Do you see, why you can only win with no risk at all? All the risk is on our side (and we are pleased to take it, because we do know, how useful this eBook is for promoting and selling your art). Is this fair enough for you? Since 2004 we have run a website for artists to promote and sell their art. We do know, that the success of an artist does not only depend on his art. Above all, the success in sales depends on professional marketing. You are creating good art and you are proud of your work? Then get yourself the knowledge to promote it successfully. Finally making the money from your art, that you deserve. How much might it be worth, if you will sell your art in the future because of this eBook? How much might it be worth, if you can make a living as an artist? Carole Katchen will reveal to you how you can achieve that. She will also reveal, what expensive mistakes you should avoid and how you get the biggest success with the lowest effort. How much hard-earned money will you save because of Carole's experience? And have you ever talked to a marketing consultant or an public relations expert? Those charge you easily more than 100 dollars for an 1-hour-consultation (and that consultation alone hasn't sold you a single piece of work). The eBook "Promoting & Selling Your Art" costs 29.99 US-Dollars and might well be the best investment in your art career you've ever made. Yes, send me the eBook "Promoting & Selling Your Art" for 29.99 USD right now to jumpstart my art career. I understand, that this is a one time investment with a risk-free money-back-guarantee. My order will be processed immediately and I will be able to download the eBook within 5 minutes. I wish you great success in promoting and selling your art! P.S. : Order now and don't forget: With our Money-Back-Guarantee you really don't risk anything. You can only win by selling more of your art.